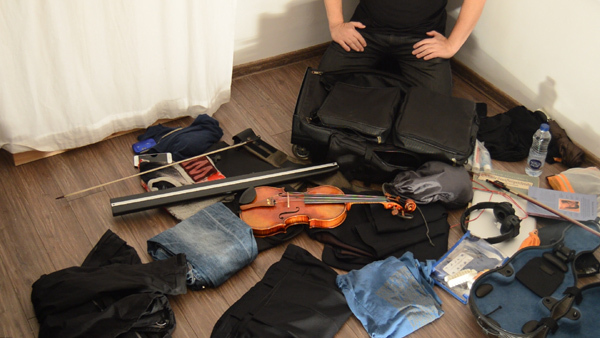 The Trinity SuitCase was created specially for the Trinity ViolinCase and BowCase . It uses every millimeter of your baggage allowance. The stucture is rigid in some sections and elastic in others. No wheels or thick bumbers stick out to eat up precious millimeters. 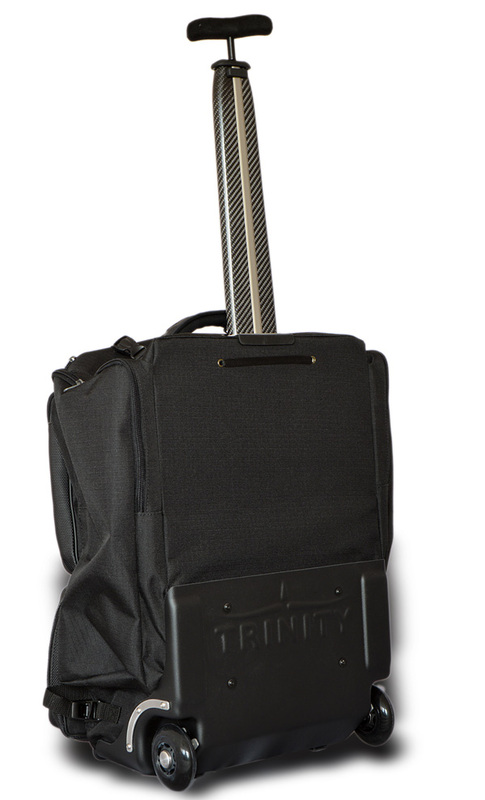 The Trinity BowCase (without its soft cover) is used for leading the SuitCase. 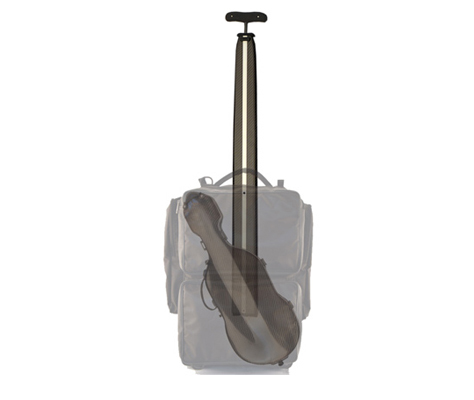 The detachable, with the click strap permanently attached to it, locks easily into the tip of the BowCase. 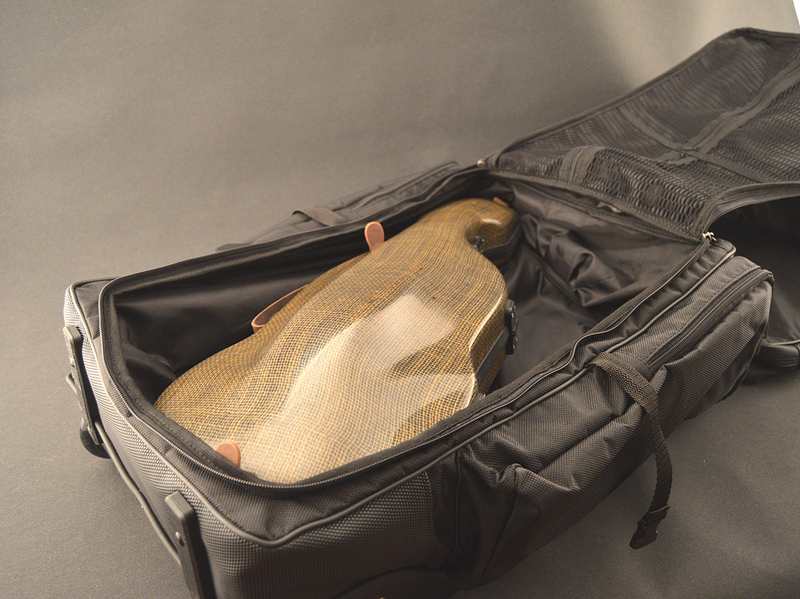 The Trinity BowCase (without its soft cover) is used for leading the SuitCase. Slide it into the channel, and connect both click ends. You can lead the SuitCase (with the Trinity ViolinCase inside) through the gate at the airport like any other passenger. 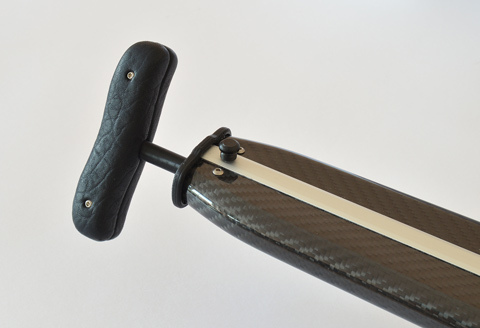 You can choose the model of the Handle - Fixed or Rotating. 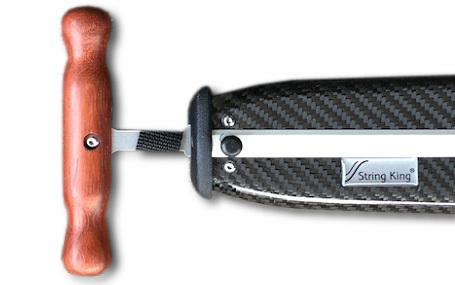 The Rotating Handle turns around 360 degrees, which eliminates any strain to the BowCase and your hand. You can hold it in a natural and comfortable hand position. You have to be more careful though when leading the SuitCase, as it overturns easier on an uneven surface. 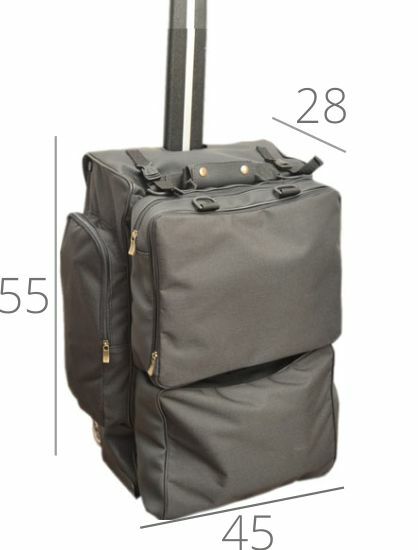 Trinity Basic SuitCase is adjustable. Its minimum size is 55x35x20 cm (21,65x13,8x7,9 inch). 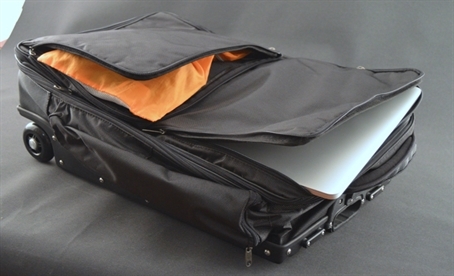 By filling its expandable cover and side-pockets one can “blow it up” to the maximum size - 55x45x25 cm (21,65x17,7x9,85 inch). 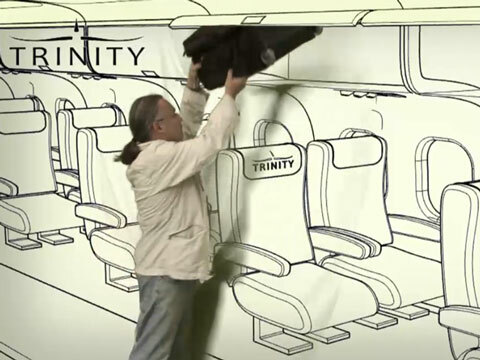 With Trinity Basic SuitCase you can always fly with the luggage of largest size allowed by a specific airline. 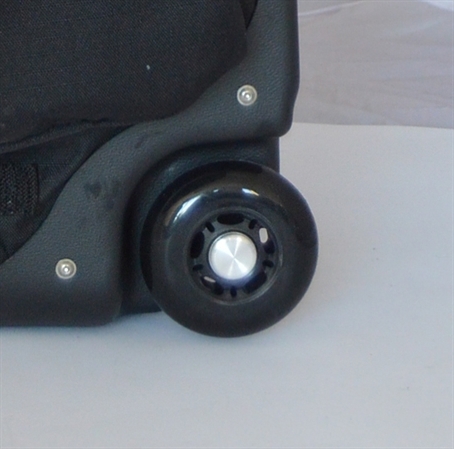 We use large, robust rollerblade wheels with metal bearings which should last forever, and are easily replaceable. The result is a smooth and silent ride with damped vibrations. The wheels of normal suitcases are usually small and simple, which results in a jumpy and noisy ride and frequent mechanical problems after limited period of time (usually one can't replace them either). 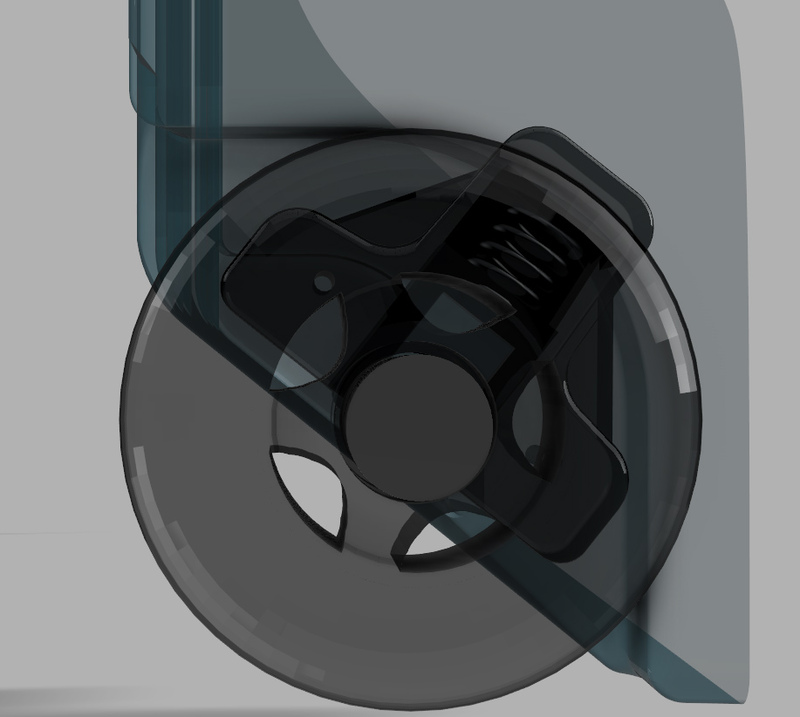 We use large, robust and slightly suspended rollerblade wheels with metal bearings (which can withstand much greater forces). In a unlikely event of damage after years of use one can easily find a replacement in a sport equipment shop. Recently there was some rumors about forbidding wheeled suitcases in Venice because of noise they create/produce. With Trinity SuiteCase it wouldnt be a problem  its already Venice ready! 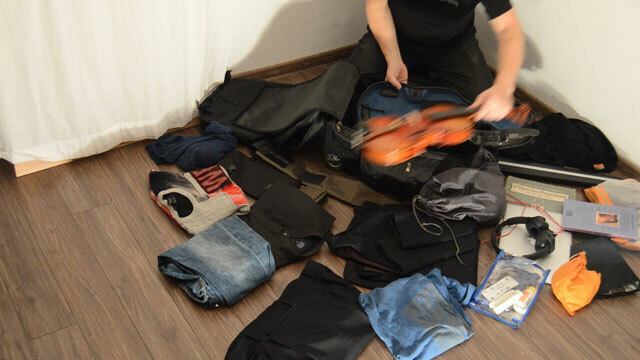 If you still feel uneasy about rolling the Trinity SuitCase with your violin inside on an uneven surface you can always carry the Violincase on your back and put it inside the SuitCase when you arrive at the airport. The floors there are always very smooth, so there is no risk of shaky ride. 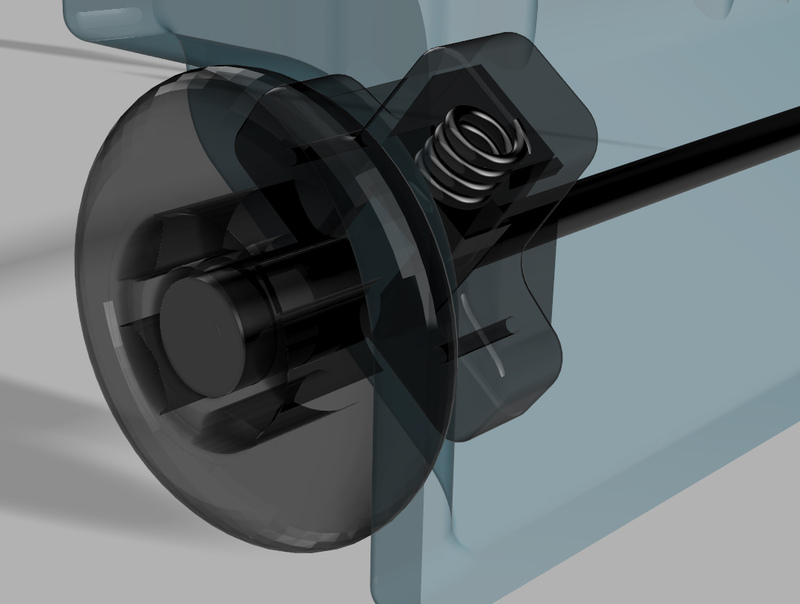 If you want to have even better suspension you can add our own Spring Suspension System (SSS).The wheels will damp vibrations a bit like in a car. 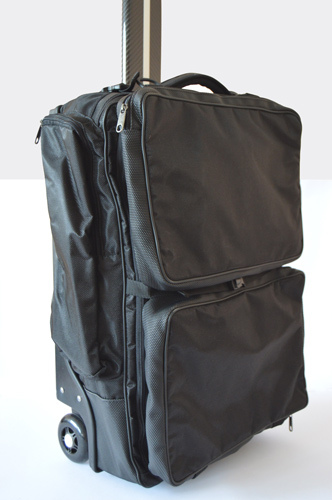 Trinity SuitCase with a traditional lid has 2 outer pockets large enough for a 13’’ computer and 2 inner net-pockets. 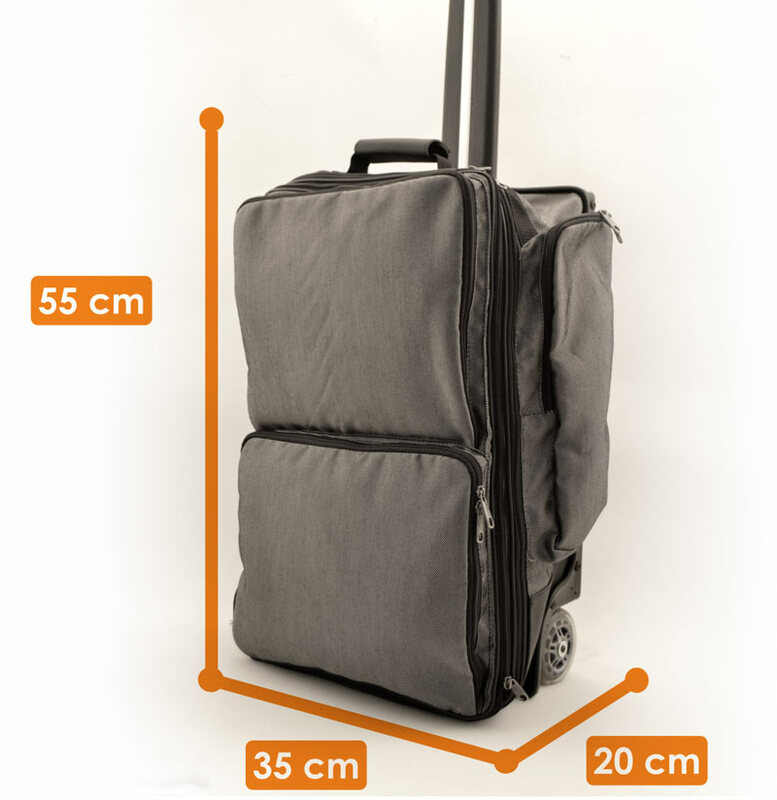 The whole lid is expandable so you can vary the thickness of your SuitCase between 20 and 25 cm. 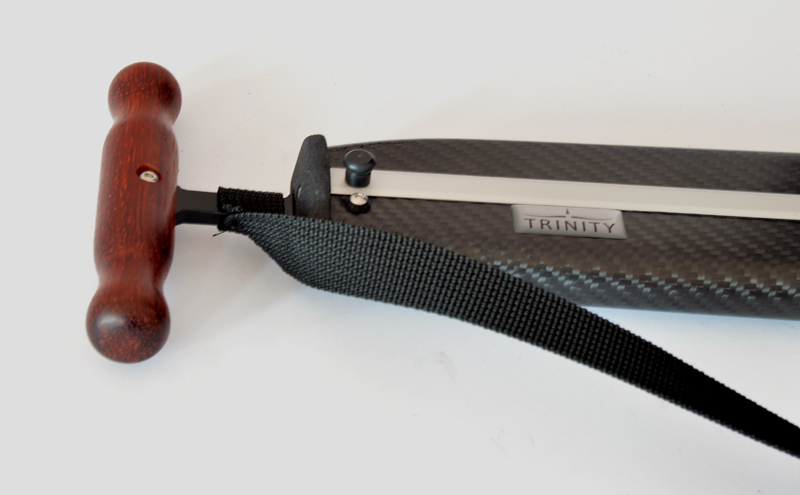 Trinity SuitCase with a detachable lid is another unique solution by String King. 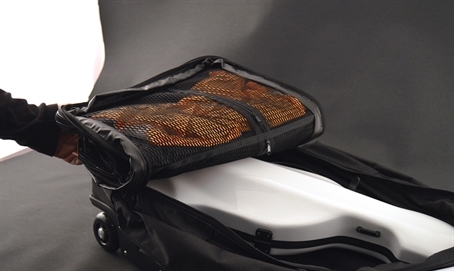 You can detach the lid and turn it into a shoulder bag in seconds (the separate shoulder strap is provided). 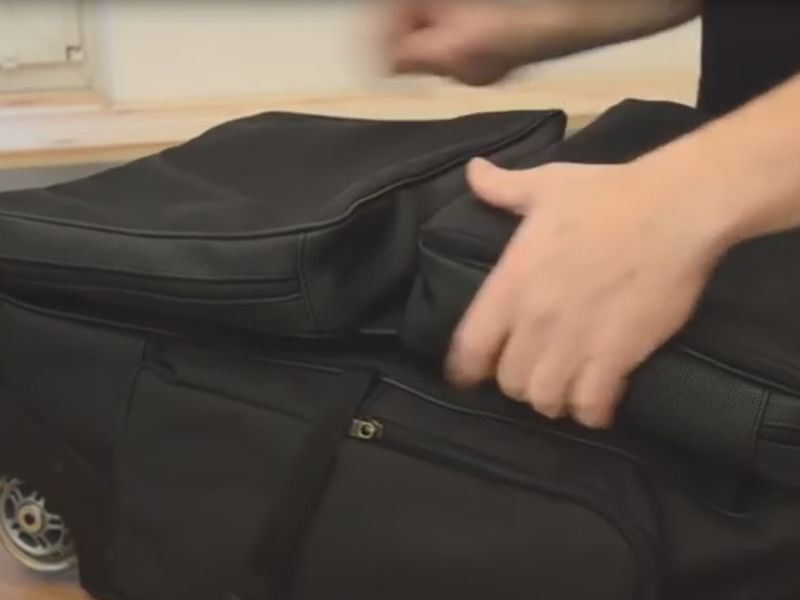 You can leave the SuitCase at the hotel and carry the bag with all the stuff you may need. Its great for every-day use. 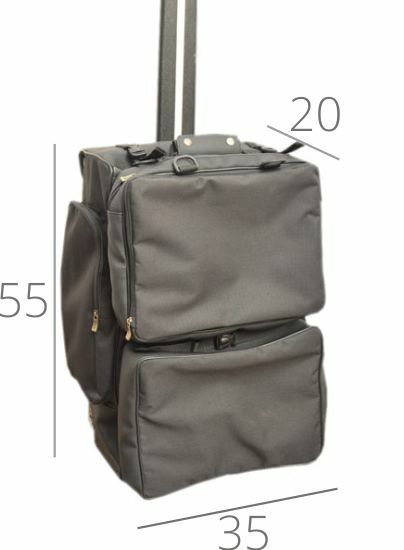 There are many internal compartments and the top pocket is expandable for extra space. Most of airlines allow a 2nd piece of cabin luggage. 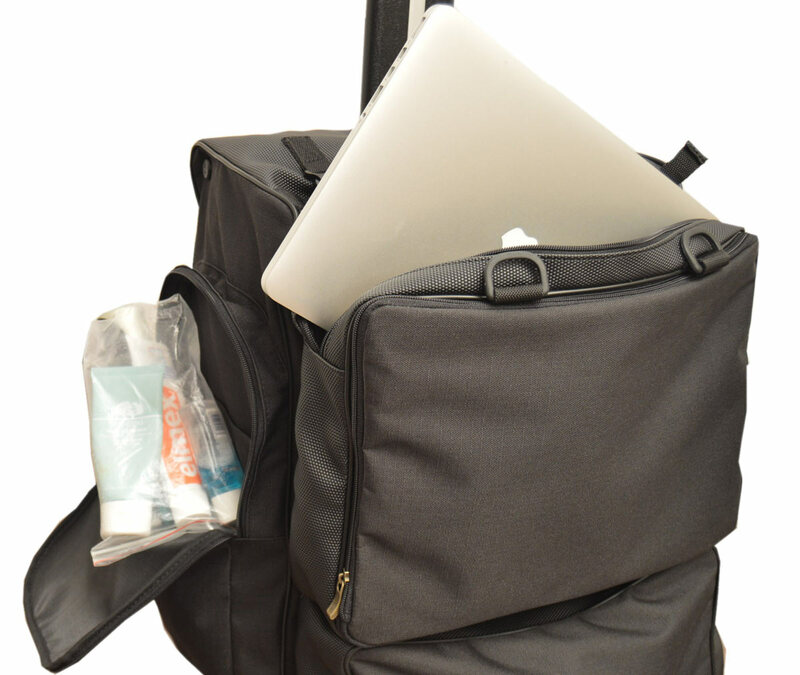 That means that you can detache the lid, fill all the pockets of the shoulder bag and place it under a seat in front of you. At the same time you can expand the top pocket of the SutiCase itself up to 25 cm/10 inches total thickness. It gives you plenty of extra valuable space for your stuff. Handle available in 2 options : rotating and fixed. Two bows are hidden in the BowCase (which works as a suitcase shaft). Soft part is made from strong textile nylon material. Heavy duty ABS protector, no fabric to ground contact.